Poutineeeeeee. A Canadian classic. ?It's by far one of my favourite comfort foods, regardless of the time of year. Unfortunately for me, there are just way too many calories consumed with this dish so it's not something I indulge in very often. Well, I've got good news poutine lovers and calorie counters! 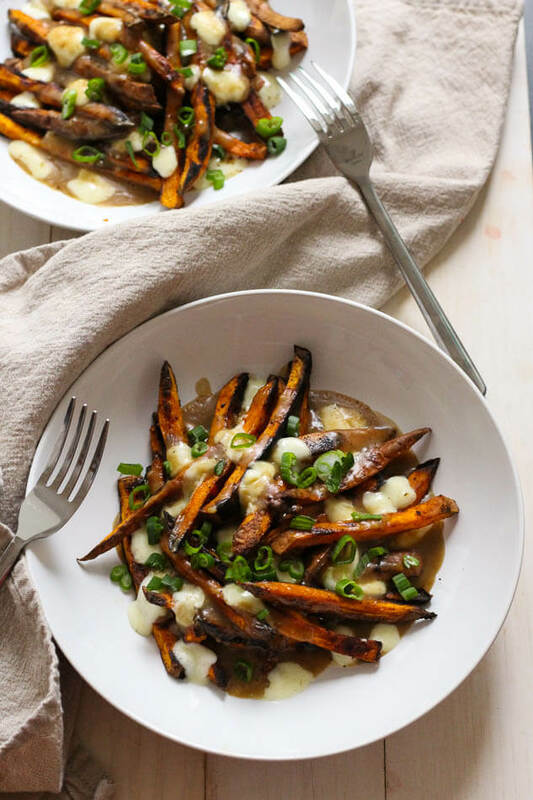 This Sweet Potato Poutine with Vegetarian Gravy is a healthier, more wholesome alternative to traditional poutine. With everything you see here made from scratch – with the exception of the cheese curds – this is the perfect Friday night meal to hide out from the cold with.? Believe it or not, sweet potatoes are in season in January so now is the perfect time to pick some up and enjoy! As a general rule, I substitute regular potatoes, rice and other starches with sweet potatoes on a regular basis because they are an excellent source of vitamin A (in the form of beta-carotene), vitamin C, dietary fibre and potassium. Don't get me wrong, regular potatoes are still great for you, but one serving of these bright orange-coloured potatoes can serve up to 90% of your daily vitamin A intake! This vegetarian gravy is super quick to put together, and will remind you of a richer French onion soup. It definitely is different from the traditional beef gravy used on regular poutines, but I think it tastes different in a good way. I mean, I'm already shaking things up here with sweet potato fries! 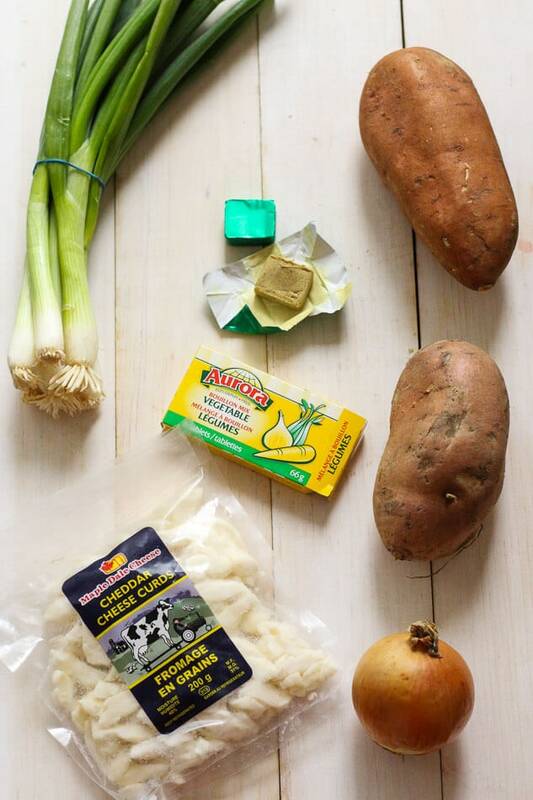 And the best part is, you most likely already have all the ingredients on hand: olive oil, onions, garlic, a vegetable bouillon cube, butter and flour. Boom. 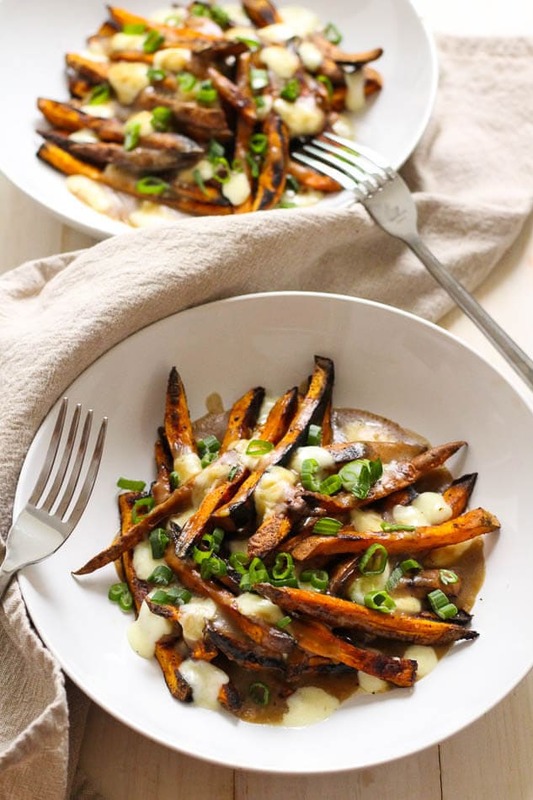 Are you going to give this Sweet Potato Poutine a try? If you do be sure to tag me on Instagram and Twitter – I’d love to see what kinds of toppings you use!? 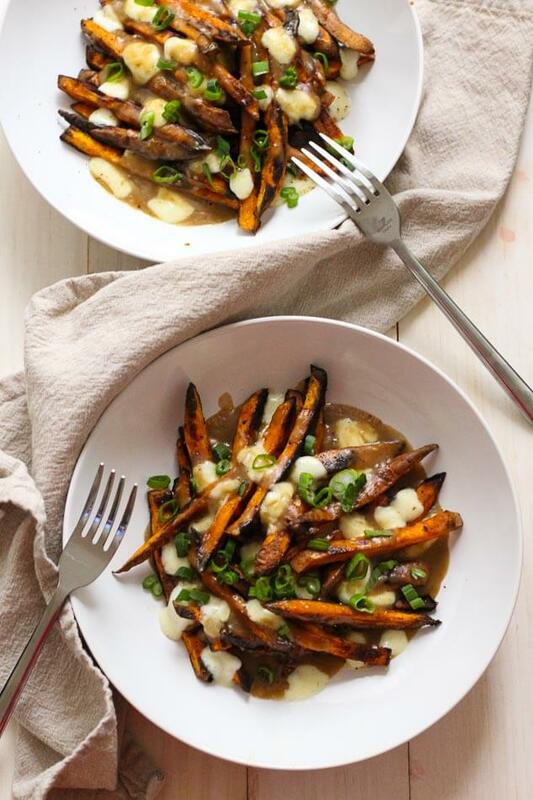 This Sweet Potato Poutine with Vegetarian Gravy is a healthier, more wholesome alternative to traditional poutine! + Anything you can think of adding! 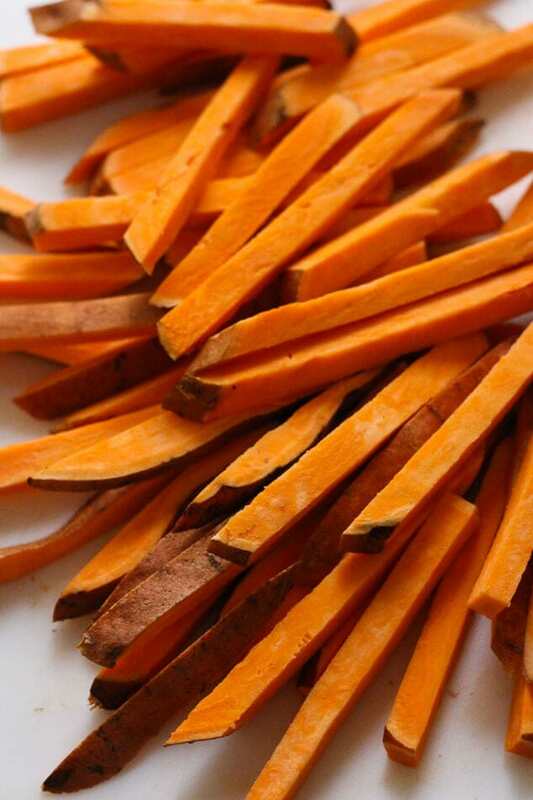 Cut sweet potatoes into 1/2 inch thick fries, then immerse in cold water to get rid of starch. Dry fries with clean towel and place in large bowl. 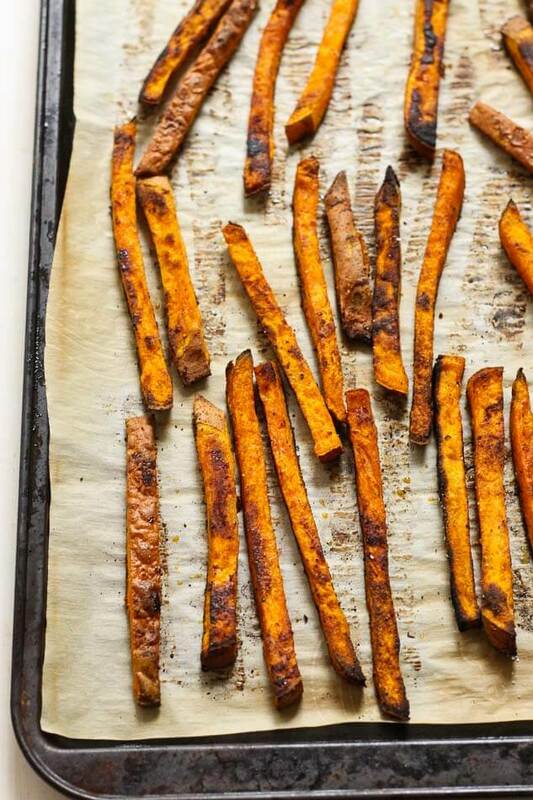 Toss fries with olive oil, salt and spices then transfer to parchment-lined baking sheets (you will probably need one sheet per potato). Cook in the oven on the middle oven rack for 15 minutes, then flip and cook for another 12-15 minutes. Meanwhile, while fries are cooking, make your gravy. In medium saucepan on med-high heat, add olive oil. Slice onion and chop garlic, then add to pan, sautéing for about 6-7 min stirring often. Add bouillon cube and water, and stir until well blended. 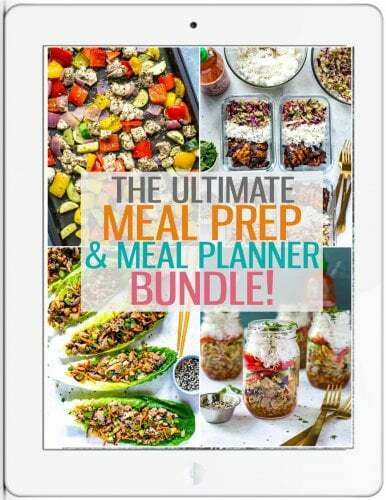 Pour mixture into food processor, blender or Magic Bullet and blend until combined. Pour back into saucepan, then bring mixture to a boil. Add butter and red wine, stirring until combined. Add flour in slowly and gradually, whisking to avoid lumps. Let simmer for 10 minutes on low heat. Fries should be finished around this time, so pull them out of the oven and transfer them to a pasta bowl or plate. Sprinkle with cheese curds, then ladle gravy overtop. If gravy isn't hot enough (but try and make sure it is!) then you can always put the dishes into the oven and broil until cheese becomes melted. Of course if you choose to do this make sure your plates are safe to go into the oven! Enjoy right away and be prepared to be stuffed!! Thanks Louisa!! The vegetarian gravy definitely has a distinguishable taste unlike beef gravy but it’s a different kind of “good”. Hope you try it! Oh what a fun spin on a Canadian classic! Can’t argue the benefits of using Sweet Potatoes over boring ol’russets. Thanks Amanda! Now that sweet potatoes are in season I’m finding I’m using them more and more in my recipes! I’m literally salivating, your photo’s are fantastic. Sweet potatoes are such a great substitution with all the nutritional benefits! I guess I’ll be indulging in some poutine soon, guilt free!! Thanks! Hahahaha thanks Tara!! I think the cheese curds are what keep the integrity of this poutine. You just can’t settle for any other kind of cheese here! These are some of the most appetizing pictures ever. The way the curds are melting and the gravy! I want some of this right now!!! 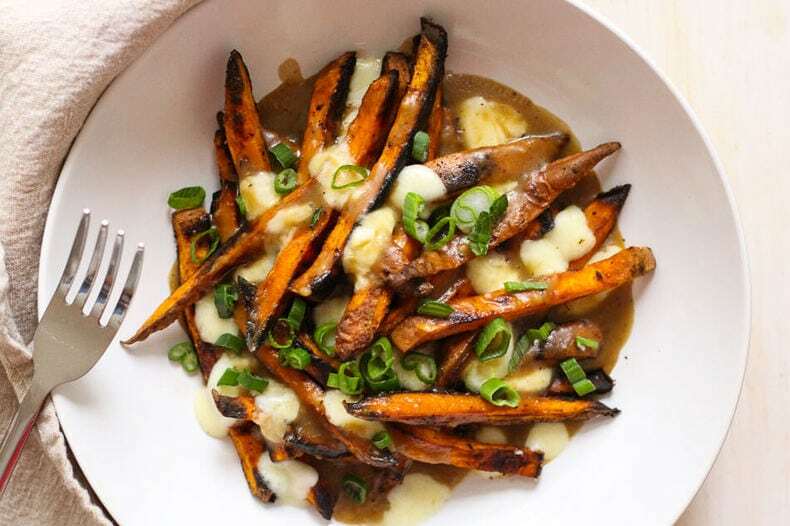 I have T-Fal ActiFry that I use for fries, I think it’s time for Sweet Potatoes Poutine! Aww thanks Julia 🙂 I have been wanting to get an ActiFry for sooooo long, I’m super jealous you have one!! 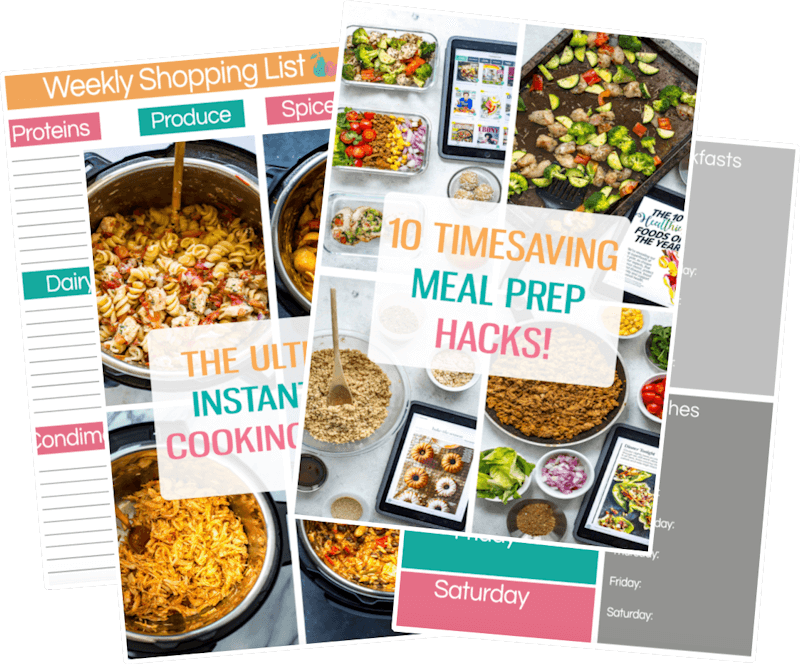 Between that, a better knife and a food processor…I swear I get more excited over kitchen gadgets these days than I do clothes, makeup, etc. I guess I’m growing up lol! DUDE! You are my savior right now. MY SAVIOR. My Mom brought me legit cheese curds from Canada at Christmas and I wanted to make poutine before going pescetarian in the new year but…I never got around to it. “No problem!” I thought – because the supermarket has those packets of mushroom and onion gravy. Unfortunately, listed in the ingredients of these, is beef fat. WOMP womb. So, I thought I was probably doomed. BUT NOPE. TAYLOR SAVES THE DAY. I am totally going to make some veg gravy and blog my poutine and shout out to you SO HARD. My 9 year old son loves poutine! Can’t wait to try this! Aww that’s so sweet! Let me know how it turns out if you try it! Somehow, despite growing up in Quebec and developing a love for the greasiest poutines out there, I never thought of making it myself. This is such a good option because 1, it’s a little healthier than casse-croute fare, and 2, I can eat it on my couch! Can’t wait to try this. Great recipe! I’m poutine obsessed and I love the twist you put on it! I literally just yelled across the room , describing this recipe to my husband. He would LOVE THIS! LOL Liz, I love it!! Thanks for sharing that? Oh, swoon! This sounds EPIC!!! This looks amazing, I’m so excited to try it! I love twists on a classic. We are always searching for Healthy Sides for our grilling classes. This looks like a tasty one.